Each year, Stony Brook students and employees share their time and talent through thousands of community service hours. With unique educational opportunities, donation drives, cultural events and more, Stony Brook University is a caring community, proud to share its time, resources and expertise to improve the lives of others. Visit this blog every day from November 24 to December 24 to learn of the many ways Stony Brook gives back to the community. Stony Brook is the first SUNY school to stage this type of technology-based response to a crisis, according to Chris Sellers, director, Center for the Study of Inequality and Social Justice and Policy. Volunteers use laptops to map Puerto Rico disaster sites. 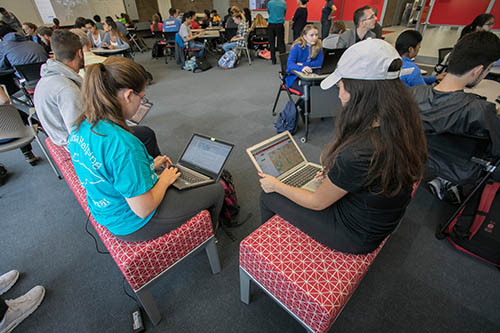 The Map–A-Thon took place at the Stony Brook University Libraries North Reading Room and was organized by the Center for the Study of Inequalities, Social Justice and Policy, the Geospatial Center at the School of Marine and Atmospheric Sciences and Stony Brook University Libraries. Using their personal laptop computers, during a three-hour period Stony Brook students, professors and employees navigated satellite maps in search of buildings not yet documented in relief efforts. Next, they zoomed in on street maps, traced outlines of structures and then uploaded and saved them to a master file used by the Red Cross as an aid to providing relief services to hurricane victims. 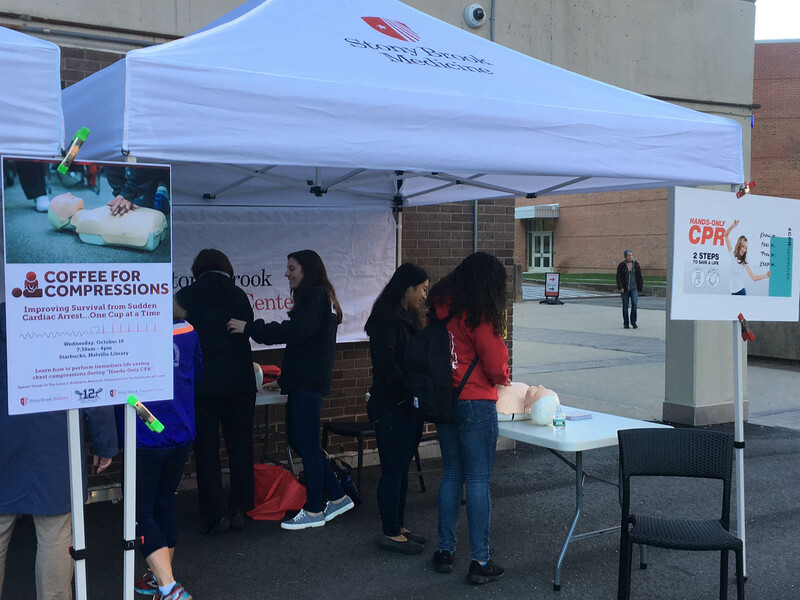 Volunteers and participants gathered outside the Melville Library’s Starbucks on October 18 to participate in a Hands-Only CPR (HOCPR) training session. By the end of the event, 263 people on Stony Brook University’s campus were trained. Hundreds from the campus community participated in the Hands-Only CPR training. Coffee for Compressions, a new community engagement program, provides an opportunity for those nearby to learn about HOCPR training and test their chest compressions on a feedback manikin to earn a Starbucks gift card. Participants were required to do two minutes of two-inch-deep compressions to receive a two-dollar gift card. Colby Rowe, Trauma Center Education and Prehospital Outreach Coordinator, developed the idea for this incentive-based program. The Stony Brook Trauma Center was the lead team for the management of the event. Approximately 25 volunteers came from the Stony Brook Volunteer Ambulance Corps. Each year, Stony Brook students, faculty, staff and alumni share their time and talent through thousands of community service hours. This caring campus community has a positive impact on friends and neighbors locally and around the world. From organizing clothing drives to blood donations to bringing a smile to a veteran's face, Stony Brook University is committed to sustained, lifelong community engagement. Each day in December we will showcase one of the many ways Stony Brook University is making a difference. For questions or comments, contact the Office of Community Relations.